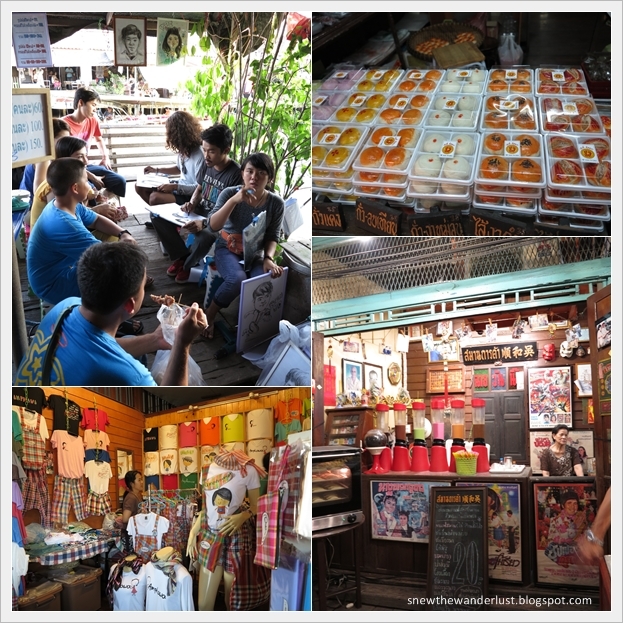 When one talks about the floating markets in Bangkok, you think of it as a tourist trap, filled with tourists from tours. The boat vendors, selling fruits, vegetables and souvenirs would be touting along the crowded waterways, and the waters has since turn into a muddy playground. Picture this, and most of us, who are repeat travellers to Bangkok would shun away from it. This is perhaps, what the Damnoen Saduak Floating Market looks like today. One of my ex Thai colleagues painted me a different picture, and told us another Floating market - Amphawa Floating market visited by Thai tourists (ie locals), my eyes lighted up and my curiosity search began. Unlike the over-crowded Damnoen Saduak Floating Market (about 2.5hours or 100km away from Bangkok ) that operates from the early morning, Amphawa Floating Market (about 1.5hours, and 70km from Bangkok) is an afternoon or evening market. As with my previous post, we visited both the Maeklong Railway Market and Amphawa Floating on the same day. Amphawa Floating Market opens in the afternoon till night, Friday - Sunday, and is the most busiest after 4pm. Unlike the other day markets which you need to wake up wee hours in the morning from Bangkok and travel about 2 hours to get to the morning floating market, you can get travel from Bangkok to get here after lunch. This is the place to visit for genuine floating market experience. The place is predominated by Thais although there seem to be an influx of independent tourists. You see few 'farangs' - the Thai word for Caucasians, over here. You don't get onto the boats to tour the river canel although you can go on evening boating trips to see the fireflies (which I did not try). Instead, the boats are mainly for the hawker stalls, where the meal is prepared on the boat, and send it to the guests, seated at the river bank. Most of the eateries here serve seafood along the riverside. The 'chef' prepares the food on the boat, then pass it on to the stall holders who takes orders and delivers the food to the guests who sits on steps and benches just facing the river. This is the real Alfresco dining experience! It was really crowded on the Sunday afternoon when we visited, and the place is so packed with the locals that we couldn't get any seats to try the "alfresco dining". Stroll along the sides of the river, and you see a number of quail shops, including a traditional Chinese pastry shop. You can cross the river over the busy bridge (there are a few), with the largest and most crowded link-bridge at the cross section. Enjoy a breeze stroll along and capture nice views along the river canel. Rustic surrounding that you can't find in the busy city. Night was approaching and we decide to settle for dinner in a busy restaurant. We were attracted to the BBQ seafood that was being prepared infront of the shop. 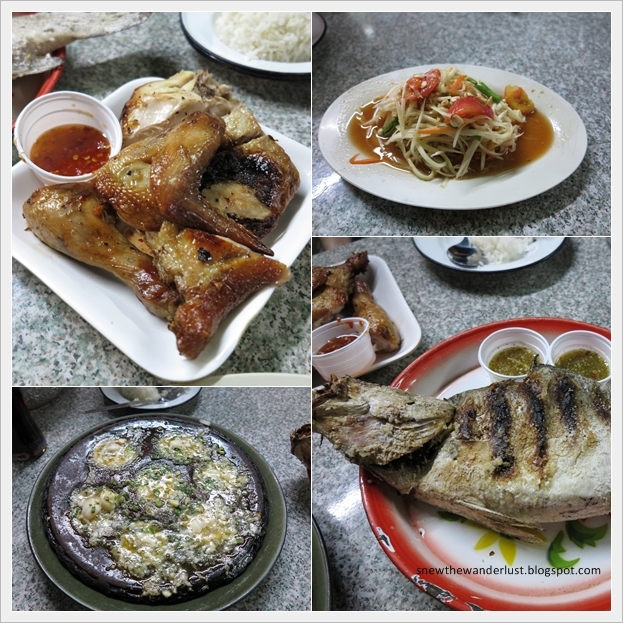 It's yummy seafood dinner at very reasonable price. Very soon, it was nightfall, and time to make our way back to Bangkok. But before we go, I manage to take some decent pictures of the night view of Amphawa Floating Market. I definitely recommend this place. Although you don't get to sit on the boat to experience life on the river, the experience of walking along the riverside with quail shops and seafood eateries is more worthwhile, then being hassle by the touts of hawkers on the boat. This is a more genuine experience of a Thai then a touristy floating market hunt. If I'm given a chance to come back, I may like to spend a night here, so that we have more time, to sample the street food, shoot picturesque photos, and not having to rush back to Bangkok. after watching the images i am planing to be in this floating market.